Manolo says, over the past several weeks the Manolo has received many, many, many letters like the following from his internet friends. I appreciate your advice for women with the tiny feets, but I have the complete opposite problem. What about the woman with the wide feet, the big feet, the feet with high arches? What can she do? 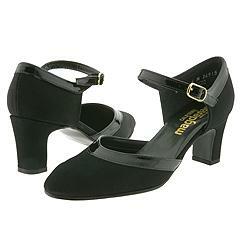 Is she doomed to terribly unhappy shoes from Hush Puppies or Naturalizer or Easy Spirit? Manolo says, the wide feets they are indeed the problem for the girls who wish to look super fantastic. However, the Manolo he can make the few recommendations. If the girl she is possessed of the ordinarily wide feets–the sizes the C, the D, or the W–there are many shoes available at the Zappos that meet the requirements of both the size and the super fantasticness. For the example this beautiful black boot from the Stuart Weitzman, which the Manolo he has recommended it in the past, it is available in the size W up to the 11.5. If you wish to see more of the shoes that are in the wider (or the longer) sizes, the Zappos, they have the search engine that can accomodate this. Much more difficult to find, however, than the sizes the C, the D, or the W, are the sizes the E, the EE, and the WW. Here the options they are reduced. The search of the Zappos, and the search of the sites specifically for the wide feets, like the DesignerShoes.com, show that the selections they leave much to be desired. However, there is one brand of the shoe that has the selection in the widest of the wide sizes, these they are the shoes of Magdesian Brothers. These shoes, they are the moderately priced shoes for the big-feeted girls who will not give up completely on the stylishness. Here are two pairs that are available in the WW up to the size 14, and that the Manolo he could live with. This shoe, it has the round-toed, retro styling and the chunky heel that are very much of the moment. This simple black mule, it will create the illusion of the more slender foot. 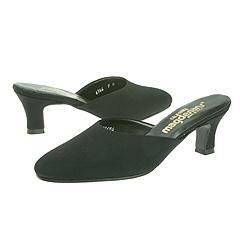 Sadly, most of the other shoes from the Magdesians, they will make you look like the Mrs. Doubtfire. Manolo says, of the course, the best and most super fantastic of all the solutions to the problems of the too large, and the too small feets is to have the shoes custom made. Nothing compares to this in the terms of the fit and the beauty of the finished product. This entry was posted on Wednesday, March 30th, 2005 at 12:13 am by Manolo the Shoeblogger and is filed under Be Super Fantastic, Bruno Magli, Shoes, Stuart Weitzman. You can follow any responses to this entry through the RSS 2.0 feed. Both comments and pings are currently closed. Big laugh from me this a.m. at the Magdesians=Mrs. Doubtfire equation. How true, how true. Thank you, Manolo, for thinking of us. My feet are in the first category–size 9, sometimes a B fits, sometimes I need a C. The strappy sandals that I long to wear at this time of year are a real problem for girls like me, as our feet tend to squish out unattractively between the slats. Sandals with broader straps are essential. Also, I find the customer comments section at zappos.com very helpful in weeding out the shoes that run narrow. For the poor girl with wide feet, Nine West has many lovely shoes in wide widths on the website. and oh, those Stuart Weitzman boots are the height of classy boot beauty! 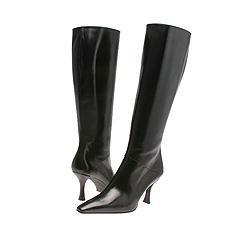 But does the Manolo feel for the ladies who have the larger calves yet wish to find the tall boots of good quality? The Nannah does not enjoy wearing the, how you say, rich Corinthian pleather. Good question Nannah, I also have trouble fitting my robust calves into anything higher than an ankle. I only can buy those that have elastic panels or other things that make the boots stretch around the calves. 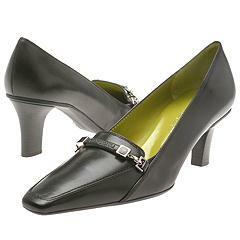 Alas, those beautiful Bruno Magli pumps run narrow, according to the Zappo’s customer survey. Buyer beware! How lovely to hear the voices of the sturdy legged women! I am, in most ways, a very average sized woman (8 or 10) who longs for the classy, tall boot but instead I trudge bootless from the shoe department in shame and despair. I thought I was alone in the dilemma of the well-rounded calf but now I see we are part of a sisterhood. Why do the shoe designers not hear our cries? The shoe designers do not hear the cries of the wide-footed woman, because few are the women willing to put their wide foot out there and say, “Shoe me appropriately” and not take no for an answer by voting with their pocketbooks and leaving their egos out of the equation. By that I mean, sadly, that many women with the wide feet squash said feet into too-small shoes out of pride. And consequently, make podiatrists rich. So they feel there is no market for wide-width, well-made, non-Doubtfire, fashionable footwear. Plus, more shoe costs more in materials, so the profit margins are not as attractive, either. We must speak out! I have just opened a new store (website coming very soon) called dreamshoes…the shoes of your dreams up to size 15. Dreamshoes specializes in large sizes from 9 1/2 up, in wide and narrow whenever possible. I have a classic black leather mid heel high boot that is cut generously to accommodate the sturdy calf, and several other shoe styles in 9, 10, 11, 12, 13, 14 and 15 M, W, and WW. Go to http://www.shoes of your dreams.com. I found some lovely shoes at Dreamshoes for my (gasp) size 14 daughter. Highly recommended for large size shoes and wide widths! Thank you for the great advice of where to find shoes for wide feet. I’m tried of having no luck in the the departments stores. I’m tried of only finding UGLY old lady shoes , and never any stylish high heels. Thank you again.